A popular scam that always seems to pop up around the holiday shopping season has once again resurfaced.Have you gotten a text message promising a free gift card? All you have to do is click on a link? However, it was a scam. 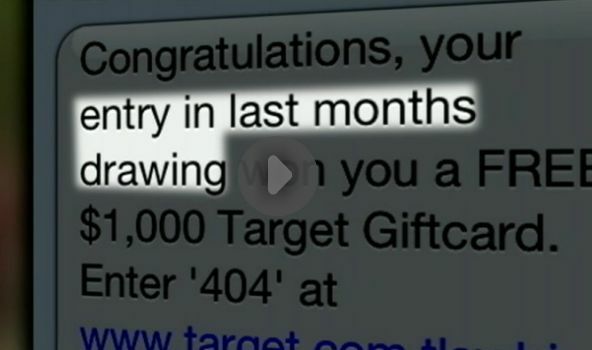 Case : A text message has been popping up on Central New Yorkers’ phones saying they've won a Target gift card worth $1,000. It’s a scam – do not click on it and quickly delete it. Links within the message connect you to bogus websites that are designed to collect sensitive, private information from people who think they've really won a prize. The text messages most frequently come from Target, Best Buy or Walmart. How did someone get your number? How many times have we filled out things for either restaurant surveys or fill out this survey and get a coupon? If that information isn't being properly secured, it's very easy to get that data if its saved in clear text or unencrypted data. People have their cell phone numbers on Facebook, and what happens is people don't properly secure their Facebook, they don't lock it down, they make that information available publicly. If the website or text asks for any banking, credit card or social security numbers, and you answer, Eston says you need to consider your identity being stolen at that point. You're giving away information that can get to your bank account and lead to identity theft. Scam book estimates more than three hundred fifty-thousand text messages have been sent out around the country. What Can I Do About Scam Text Messages ? If the website or text asks for any banking, credit card or social security numbers, Just IGNORE IT !